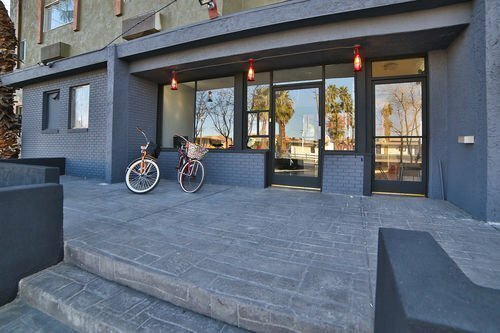 The Las Vegas Hostel is situated at 1322 Fremont Street, Downtown, offering an excellent location, close to the legendary Las Vegas Strip. The Las Vegas Hostel is situated in downtown Las Vegas, offering an excellent downtown location, close to the legendary Las Vegas Strip. While also providing an outstanding atmosphere, and being cost-effective. 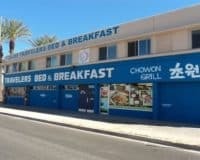 This comes alongside its claim to fame: being the only hostel in Las Vegas with its own swimming pool and hot tub. 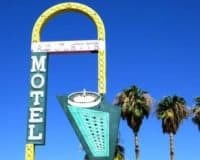 This makes it ideal for any young travelers who want to experience the magic of Vegas, or people who simply prefer the hostel experience in general. The hostel, offers a spectacular range of amenities, given it is a hostel including the aforementioned swimming pool and hot tub combination. This comes alongside friendly staff and a communal kitchen and lounge area: the perfect place to relax and meet some fellow travelers. Alongside free WIFI that is accessible throughout the entire property. The staff also put on an array of fantastic activities, which will really help you stretch your holiday budget. The lodgings are comfortable and cozy, and guests can select from a bunk bed in both mixed gender and single gender dormitories. They are all heated and have their own air conditioning, meaning that you will always feel warm and safe. 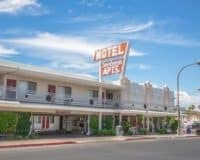 This makes The Las Vegas Hostel, an ideal location for any traveler who wants to experience the wonderful combination of Vegas living and hostel traveling. The perfect place for backpackers and young travelers to experience the magic of the entertainment capital of the world. 0.6 mi (1 km) from Fremont Street Experience. 2.1 mi (3.3 km) from Las Vegas Premium Outlets. Within 1 mi (2 km) of theFremont Street Flightlinez and Las Vegas City Hall.